Bruce McPherson, CRMP, is a Certified Reverse Mortgage Professional with with Security One Lending, America’s largest full-service Reverse Mortgage company. Bruce helps San Diego residents achieve a more comfortable and secure retirement, by properly structuring the right HECM solution for their long-term needs. In addition to educating seniors and their families about this often misunderstood program, Bruce also enjoys educating financial planners, attorneys, accountants, fiduciaries, and realtors. Bruce has specialized in the FHA Home Equity Conversion Mortgage (HECM) since 2003, which is the safe, flexible, federally-insured version of a reverse mortgage. 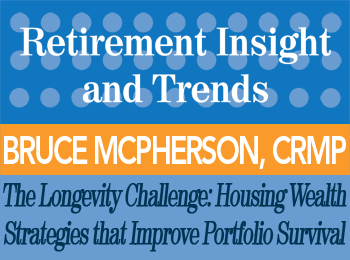 Read a summary transcript of Bruce McPherson’s presentation The Longevity Challenge: Housing Wealth Strategies that Improve Portfolio Survival in the June, 2015 issue of “Retirement Insight and Trends”. 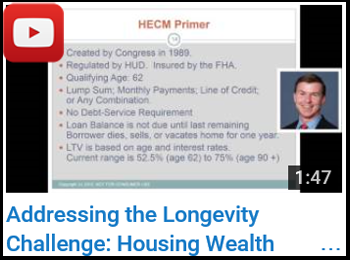 The Longevity Challenge: Housing Wealth Strategies that Improve Portfolio Survival. Have Bruce McPherson speak at your event!